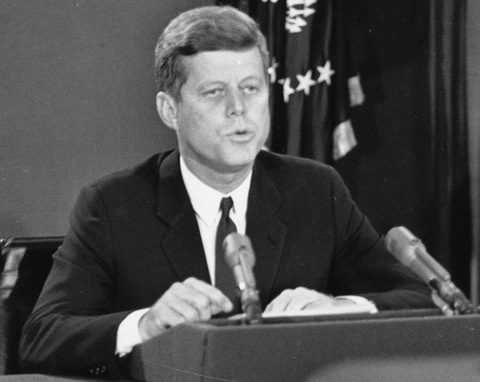 President Kennedy announces the Cuba blockade on Oct. 22, 1962, during the Cuban missile crisis. Photo by Keystone/Getty Images. Fifty years ago, on Oct. 22, 1962, the Washington Post landed on my doorstep with big headlines about a crisis atmosphere in Washington, D.C., and pictures and stories describing late-burning lights in the White House, Executive Office Building, Pentagon and State Department. It would be hours more before we learned where the crisis was, what it was about and that it would push the planet as close as it has ever been to nuclear war. I was then a 20-year-old junior at George Washington University studying politics and history and covering most of my tuition working nearly full time as a very junior reporter at a news bureau in the National Press Building that represented newspapers in Texas as well as the Arkansas Gazette, Boston Herald and the show business paper Variety. The bureau’s chief and owner was Les Carpenter, a Texan with close ties to Vice President Lyndon Johnson. Carpenter’s wife Liz, who started the bureau with him after World War II, had joined the vice president’s staff at the beginning of the Kennedy-Johnson administration. The Post immediately answered one question for me, even if the stories themselves were barely pieces in a puzzle. The Saturday morning before, I had been working at the bureau when I received a call from Liz. She asked me to read her the stories that had moved on our AP and UPI wire machines about President Kennedy cutting short a campaign trip he was making on behalf of Senate candidates in the mid-term elections in Illinois and Wisconsin. The brief dispatches said the president had come down with a cold and was returning to Washington. A bit odd, I thought at the time. Liz usually did not call our office for details of the president’s schedule. Then I put it out of my mind and went back to writing my story about movie theater gross receipts for Variety. Now, I realized, the president had returned for urgent meetings with his top officials, a group called the Ex Comm (Executive Committee of the National Security Council). The officials had been meeting in utter secrecy since the previous Tuesday, when the president had been informed that U2 spy planes had come back with photographic evidence that the Soviet Union was installing medium range missile sites in Cuba. The president and the others in the group had gone to great length amid ruses and decoys to keep their deliberations secret, both from the Soviets and the American press and public. The veil only began to lift that Sunday evening. But even as the hours wore on that Monday, there was no official word, beyond the announcement from White House Press Secretary Pierre Salinger that the president would address the nation at 7 p.m. Eastern Time. There were, of course, plenty of rumors. Only 18 months before, the United States had tried and disastrously failed to invade Cuba and overthrow Fidel Castro. The president was taking heat from congressional Republicans, led by New York Sen. Kenneth Keating, that the Soviets were conducting a military buildup on the island. Berlin, divided for a year by a grotesque wall, had been a Cold War flashpoint for years. But for once, the often blustering leader of the Soviet Union, Nikita Khrushchev, was keeping silent. Decades before cable news television, speculation was carried by radio, the wire services and word of mouth. It was such that a flurry could erupt when the head of the Federal Communications Commission, Newton Minow, entered the White House. Had the Russians shot down Telstar? Not so. We learned later the United States was bolstering its efforts to make sure the president’s speech could be heard in Cuba. That evening I made the six-block walk back to campus, to a political science class, which the professor, a legendary teacher named Hugh Le Blanc cut short with the words: “I think it’s time to go listen to the president’s speech.” (Quite a sensible contrast to the GWU literature professor who insisted on carrying on a class on VJ day until the students including my mother bolted to join the joyous din on nearby Pennsylvania Avenue). I went with a friend to his nearby fraternity house. “Good evening, my fellow citizens,” President Kennedy began. “This government, as promised has maintained the closest surveillance of the Soviet military build-up on the island of Cuba.” So, as we suspected, it was Cuba. The president described the missiles, asserting they were capable of carrying nuclear warheads 1,000 miles, a range that included Washington, much of the southeastern United States and potential targets in Latin America. He went on to build a case of the dangers of this first deployment of Soviet offensive weapons outside the USSR and how the Russians had consistently lied about it. He then outlined steps to counter it, first a quarantine on offensive equipment going into Cuba (a delicate phrasing since a blockade is an automatic act of war). In a room of about 20 normally talkative and garrulous fraternity men, the only sound was the occasional gasp. Of course, it was six days, not months, until the crisis began unwinding. But no one knew so that night and in the increasingly tense days that followed, wondering if Soviet ships would try to crack the quarantine, if indeed the Soviets would adhere to the U.S. demand to dismantle and remove the missiles, if the United States would launch a bombing strike or invasion to accomplish that end. Later that week, the office of Vice President Johnson summoned Texas reporters for a background briefing, and I managed to get on the list. (Regional reporters in Washington are now a virtually extinct species, one more victim of the economic collapse of print journalism). Alas, I am not a pack rat and nearly 20 moves in an adult lifetime are not conducive to keeping bits of paper. Hence, I have no notes from the session. About of dozen of us, and I was certainly the most junior by at least a decade, entered a conference room in the vice president’s office suite in the Executive Office Building, a Victorian-era gray pile across from the White House. The setting could have been from a movie, the elaborately trimmed, high-ceiling room that spoke of power and all the history that had taken place there when it served as headquarters of both the War and State Departments in the first and second World Wars. And Johnson, who used to fill a room with his size, gestures and voice, seemed especially subdued, talking in a low voice, his tone somber. The best news report I remember coming out of it was from Seth Kantor of Scripps-Howard. He pieced together from LBJ and other non-attributable sources just how dangerous a turn in the road the United States had reached. As that week spun on, seemingly in increasing danger, there was some talk of a few people here moving their families out of Washington. I knew no one who did, and the thought never crossed my mind, if only for the prosaic reasons that I had to go to work and school. Ever since the Soviets exploded their first atomic bomb in 1949, being a nuclear target was part of the subconscious price that we and our families paid to work and live in the nation’s capital. Countless histories and memoirs and transcripts of the Ex Comm meetings that President Kennedy secretly recorded have laid out the details of all the discussions and arguments as the crisis developed and how it wound down without a nuclear catastrophe. The key was a public deal for the Soviets to remove the missiles in exchange for a U.S. pledge not to invade Cuba. Years later, we learned details of a secret side deal for the United States to withdraw some missiles from Turkey. Word of Khrushchev’s acceptance of the public deal was broadcast on a glorious autumn Sunday morning, the kind Washington often produces as an antidote to its hot and humid summers. But for me one question will never be answered. At a book signing event in 1994, I asked Liz Carpenter what exactly she knew when she called me that Saturday morning. She ducked the question. She died six years later, taking that and probably many other secrets to her grave. And the missile crisis saga continues to be fodder for more books, and Washington being Washington, think tank conferences on crisis management. At a recent one at the Wilson Center, a premier chronicler of that saga, Harvard University’s Graham Allison told of a conversation between President Kennedy and his brother Attorney General Robert Kennedy. In response to RFK’s question, the president estimated the odds of nuclear war between one-third and one half, and that 20 million to 90 million Americans could be killed. Hmm, I thought for the first time in decades, those were not the greatest of odds for me to reach my 21st birthday. But for me those memories were subsumed a mere 13 months later in the greatest trauma of my adult journalistic life, covering the assassination of President Kennedy. Michael D. Mosettig, PBS NewsHour foreign affairs and defense editor emeritus, watches wonks push policy in Washington’s multitude of think tanks. From time to time, he writes dispatches on what those scholars and wannabe secretaries of state have in mind for Europe, Asia and Latin America.